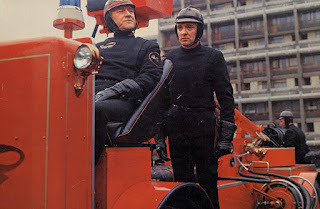 In the world of Guy Montag, the firemen’s hose does not spray water, but kerosene. It is a world were everything is backward, twisted, yet eerily familiar. People are discouraged to think, only talk about empty things and live like zombies, continuously entranced by empty popmusic and empty reality series on TV-walls. Books are illegal, and burned. It is the job of the firemen. 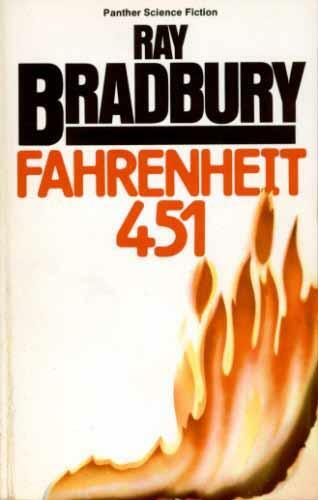 Incidentally, fahrenheit 451 is the temperature at which book-paper catches fire and burns. As you can see already, Bradbury has a very visual style of writing, with great care of imagery and the rhythm of the words. Bradbury loves words. His poetic style is still unperfected and not as controlled as in his later works. Fahrenheit 451 was one of his earliest books, written at a young age. But it makes his novel fast, short and explosive, like a fire itself. It is also a bit quirky and over-the-top in its descriptions and metaphors, but its flaws make the novel actually more lovable. And more than 50 years after publication its messages are still glowing embers. This book refuses to be put out. It is kind of distressing that some of Bradbury’s predictions have become recognisable in our modern times. This twisted world that he describes wasn’t the result of a twisted government, but it was the general tendency of the times. It was the overcrowded world, high on mass production and fast living. Fahrenheit 451 is about the loss of thinking, leading to the loss of books. But, predictably, Guy Montag the fireman sees the errors of his trade and starts an adventure of rebellion. Like Orwell’s Nineteen Eighty-Four and Huxley’s Brave New World, this is a real dystopia classic and really worth reading. It has also spawned a reasonably good movie (1966), but that of course misses Bradbury’s virtuoso writing style. Love the movie read it in high school anddid a book report on it and wow I was moved by it , makes you think what could be . Hello there! Welcome to a blog dedicated to the fine art of storytelling. Whenever a movie or a book strikes me as a particular wonderful piece of storytelling, I feel obliged to spend a few words on it. Why do I do this? For the future readers, because I wouldn't want them to miss a great experience; for the author/artist, because he or she deserves praise; for me, because I like to talk about it. For everybody, it seems. Feel free to comment on my entries!